It was confirmed on Patch-L last night. 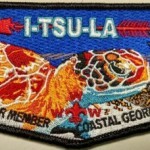 Word from Coastal Empire Executive Board Member and former Immokalee Lodge Chief Father Jason Adams is that Tomo-Chi-Chi and Pithlako lodges have formed a new lodge named I-Tsu-La. The new lodge name is pronounced “it-chula” and it means “togetherness”. The new totem for the lodge is a Loggerhead Turtle. The will use number 99. There has been some discussion on the use of the #99 (which is the Council number for the new Coastal Georgia Council) is also currently in use by Tonkawa Lodge #99 which still exists today. Thank you so much for making articles on my lodge. I’ve been a member of Itsula for 2 years now and it is so convenient pulling up this page to see what’s new on eBay. I wish you the best of luck finding all the New York patches.